This week the research journal Science published a special issue on the initial results of the Rosetta/Philae mission. 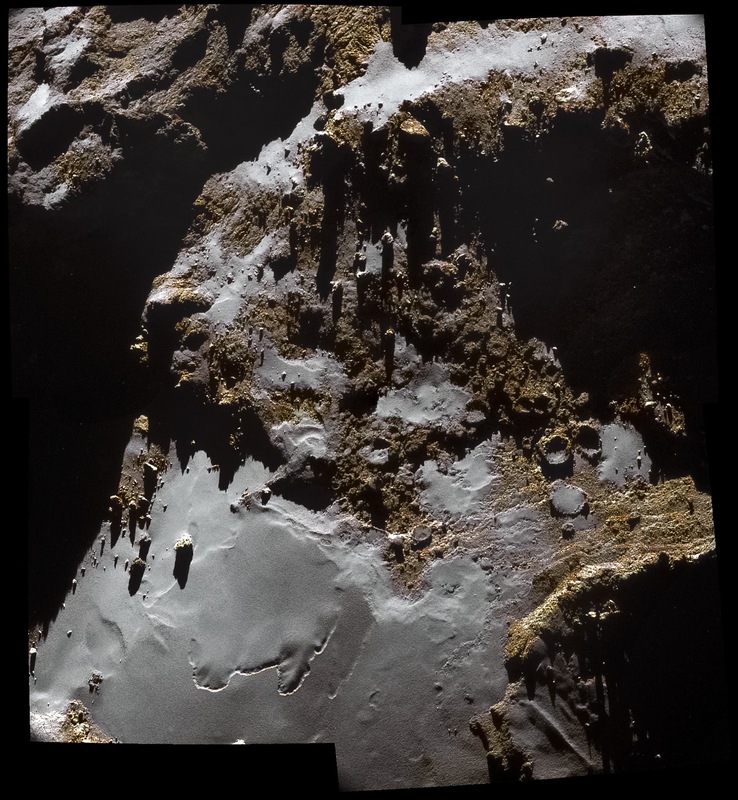 Along with it came several high-resolution and color images of the comet 67P Churyumov-Gerasimenko. The images alone are pretty astounding. The surface is diverse, with evidence of fracturing, faint jets, and a mottling of colors. It is clearly a complex and dynamic body. While the images are appealing, other data is telling a fascinating story. One of these stories concerns the formation of the comet’s magnetosphere. Comets like 67P don’t have a strong intrinsic magnetic field, so by themselves they don’t have a magnetosphere to protect themselves against solar wind. It’s icy surface is therefore bombarded by ions and magnetic fields. But as the comet approaches the Sun, volatiles such as water sublime to produce a thin atmosphere. Some of the water vapor is then ionized by ultraviolet sunlight, and these ions interact with the magnetic fields of interplanetary space. As the atmosphere of the comet gets thicker, and more of it is ionized it becomes conductive. The solar wind accelerates some of the atmospheric ions at high speed, and the resulting current induces a magnetic field around the comet. Eventually the magnetic field is strong enough that it pushes back against the solar wind, creating a magnetosphere. At least that’s what we’ve thought. Previous fly-bys of comets such as Halley have found that comets don’t have strong intrinsic magnetic fields, and we’ve seen more active comets affect the surrounding magnetic environment. But now results from Rosetta have confirmed this model by directly observing it happen. The team observed both neutral and ionized water in the comets atmosphere, as well as the magnetic fields in the region. They collected data as the comet was more than 3.6 AU to when it made its closest approach to the Sun at about 1.25 AU. They found an initial faint atmosphere penetrated by the solar wind, then watched as the atmosphere thickened to the point where it started resisting the wind through an induced magnetosphere. They also found the atmosphere is unevenly distributed about the comet (as different surface regions produced more or less volatiles) and that even a faint atmosphere interacts more strongly with the solar wind than initially supposed. This is why missions like Rosetta are important. Observing the complex interaction of solar wind and cometary atmosphere can only be done on site. It doesn’t show up in images. So enjoy the flood of new color comet pictures, but remember that we can’t see the colors of the wind.